If you paint with oils, acrylics or water colors, you need a simple system to store and organize your art brushes. 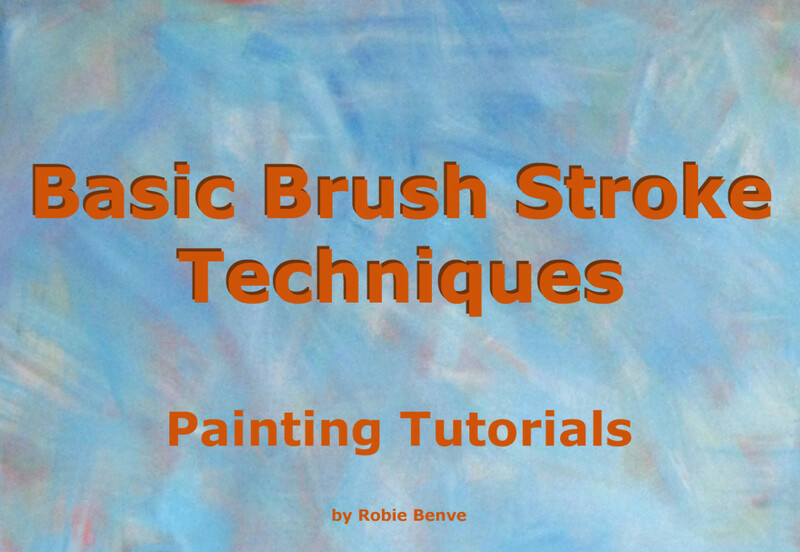 Many artists keep their expensive brushes standing upright on their handles in a jar or similar container. Storing the art brushes upright protects the bristles while they are working and makes it easy for the artist to switch between different brushes and paint colors. The art brushes are grouped together by size and by type, making it faster and easier to find the right brush when you need it. This simple artist's paint brush holder is easy to make, and this is a great project for recycling or repurposing an attractive container. A simple and inexpensive project, the artist's paint brush holder makes an easy project for a child to make as a homemade gift to a teacher, grandparent or parent who likes to paint. This artist's paint brush holder uses a tin from a gift basket of chocolates and is approximately 4" in diameter by 7 " high. A quick look around our craft room offered several similar containers that would make a good base for this project. If you don't have a suitable container to repurpose, the local craft store has a selection of durable and decorative containers. Or treat yourself to a tin of chocolates or coffee, and save the container. 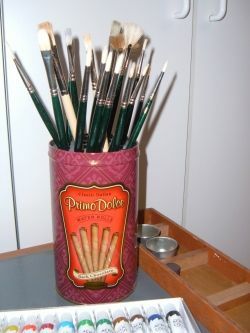 A simple stand inside the container organizes the brushes, keeping them neat and vertical. 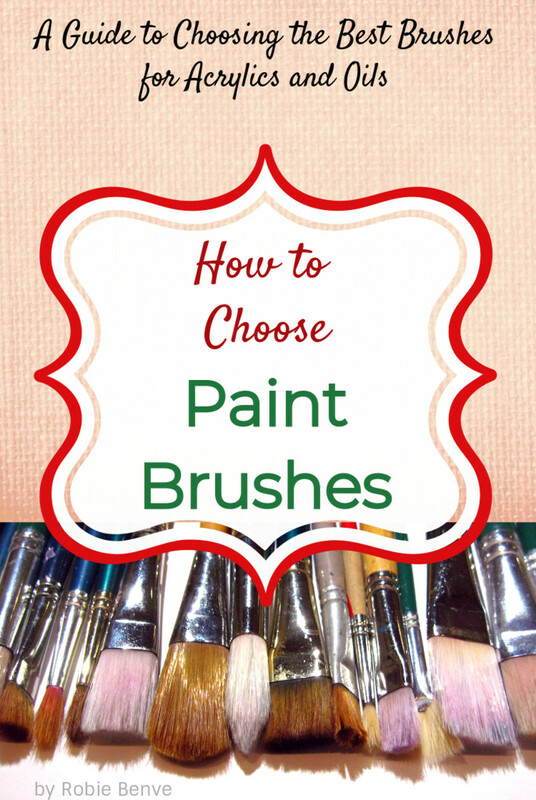 Use the different sized holes to group brushes by brush size or by function. To make the stand, start by measuring the diameter of the container. 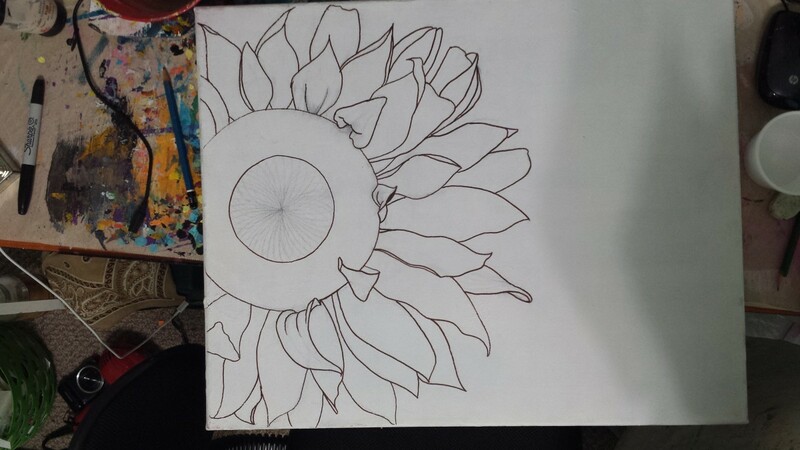 Use a compass to draw a circle that is slightly smaller than the inside diameter of the container, and then draw two circles on to a thin piece of plywood. One circle is for the top of the holder, and the second forms the bottom. Use a jigsaw to cut out the plywood circles, and then sand the edges smooth. 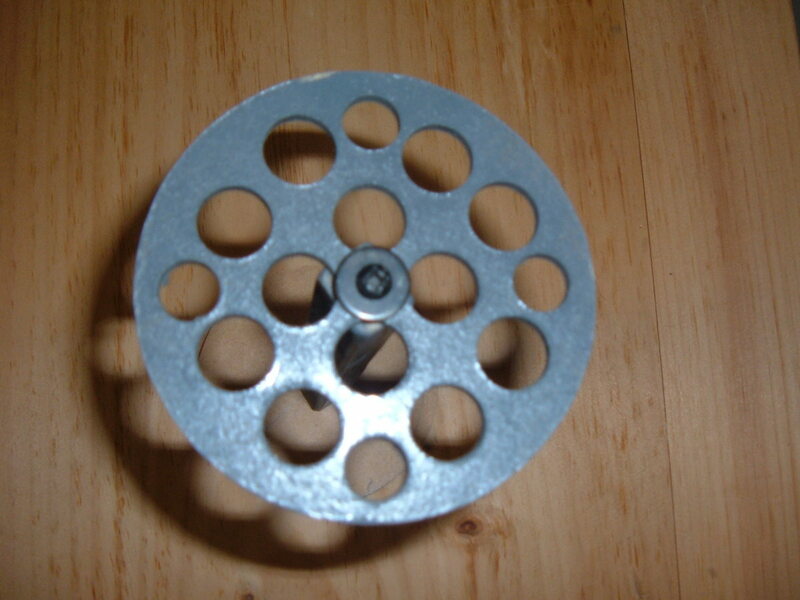 Drill a small 1/16" pilot hole in the center of circles, right on the mark made by the point of the compass. Arrange nickels and dimes to create a pattern around the circle for the top of the paintbrush holder. Coins work well as templates for laying out different sized brush holes, Once drilled through with 1/2" and 5/8" diameter bits, these holes will hold the brushes upright in the container. Cut a piece of scrap wood into a strip measuring approximately 6 " long by 3/4" square. The length of the wooden strip is determined by the height of the container: the combined height of the wooden strip plus the thickness of the two plywood circles should be slightly less than the overall height of the container. 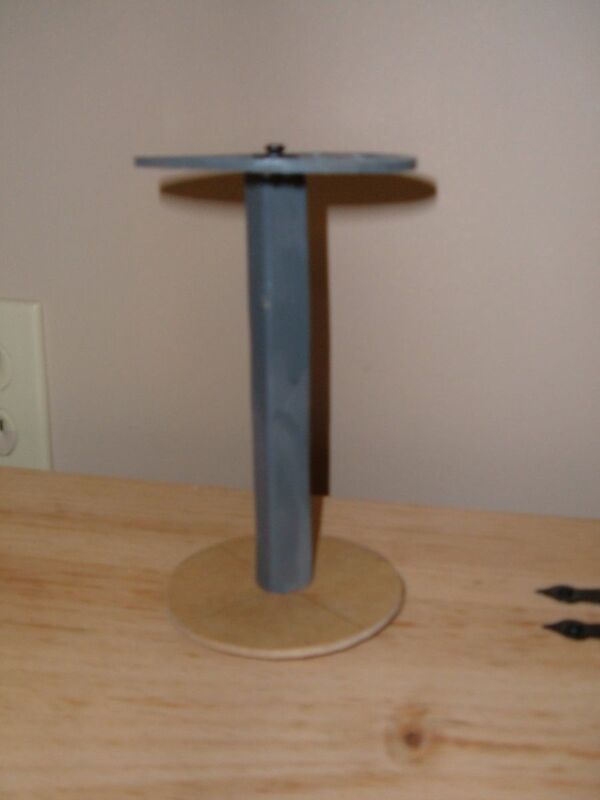 Attach a plywood circle to each end of the wood strip with a small screw. Paint the completed base with spray paint for a clean and finished look, and then drop the base into the container. Functional and attractive, this unique container is ready to store your favorite artist brushes. DIY plans with step-by-step instructions for building a portable tray that lets you work on your Arts & Crafts projects at the kitchen table, on a counter or outside on a picnic table. Like many artists, crafters and modelers, I do not have a permanent studio and I often use our kitchen table as a temporary work space for my arts and crafts projects. Protecting the table from spills and other craft related damage was a challenge, and I wanted a more durable solution than simply spreading out sheets of newspaper, so I designed this work surface. 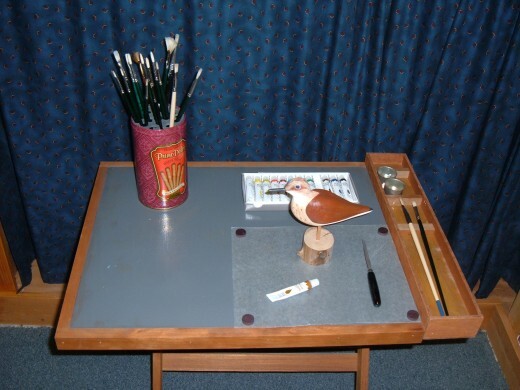 The portable art table is easy to make, provides a stable work surface for a variety of painting and craft projects, and helps protect tables and countertops from oil paint and other hobby hazards. This portable work surface features a tray for organizing tools, with an elevated "rest" for temporarily storing wet paint brushes. A "stop" along the front edge keeps the work surface from sliding across the table or countertop. I use this portable surface for carving and painting shorebirds, moving between the kitchen table, an island countertop, a folding tray table and when the weather allows, to an outdoor picnic table.Make a portable art table for yourself, or as a gift for an artist or crafter. Cut a quality piece of plywood to a suitable dimension (the plywood in the photo is 22" long by 18" wide). Use a finished grade of plywood such as birch that has a smooth surface, yet is affordable and takes paint well. Spray several coats of semi-gloss spray paint on to both sides of the plywood for a durable surface. Trim the back edge, front edge and one side of the plywood with a strip of hardwood to form a decorative edge. The hardwood edging not only looks good, but also helps to protect the plywood edges from chipping and splintering. The back and side edging is " square to match the thickness of the plywood. 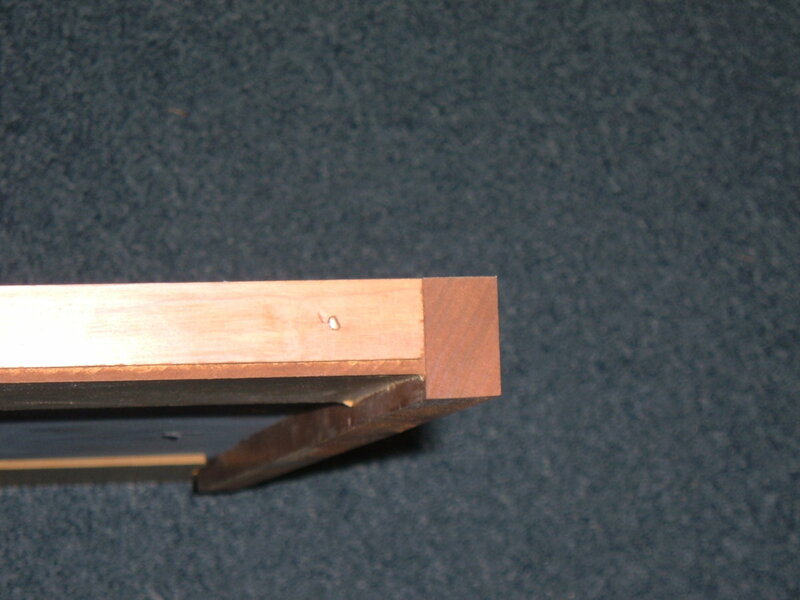 The front edging is " thick by 1 1/2" wide and extends below the plywood surface to form a "stop". Attach the edging with glue and finish nails. The tool tray is a simple box, with thin 1/4" plywood sides. Cut and glue additional thin strips of wood in place as dividers, with another strip used as a "rest" for artist brushes. 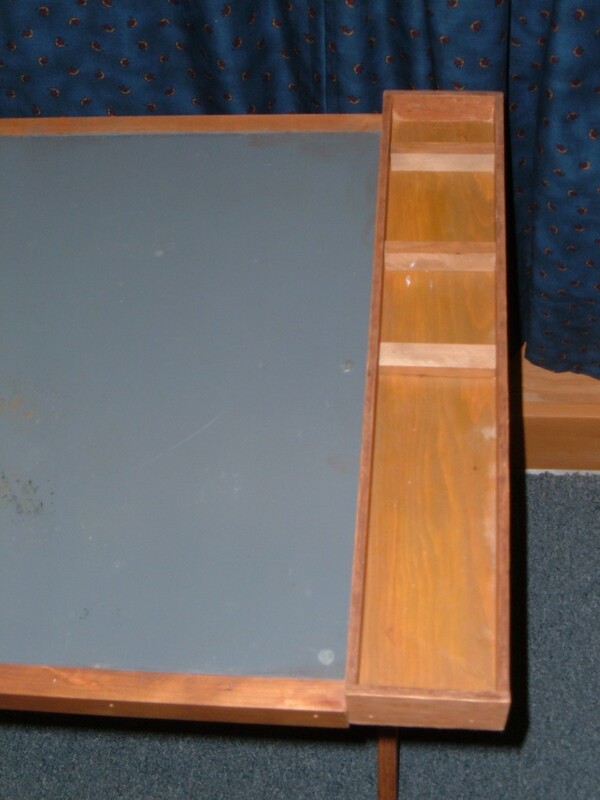 Attach the tray to the plywood work surface with more thin strips of plywood, and add another thin strip on to the bottom of the opposite side so that the work surface will lie flat and level. 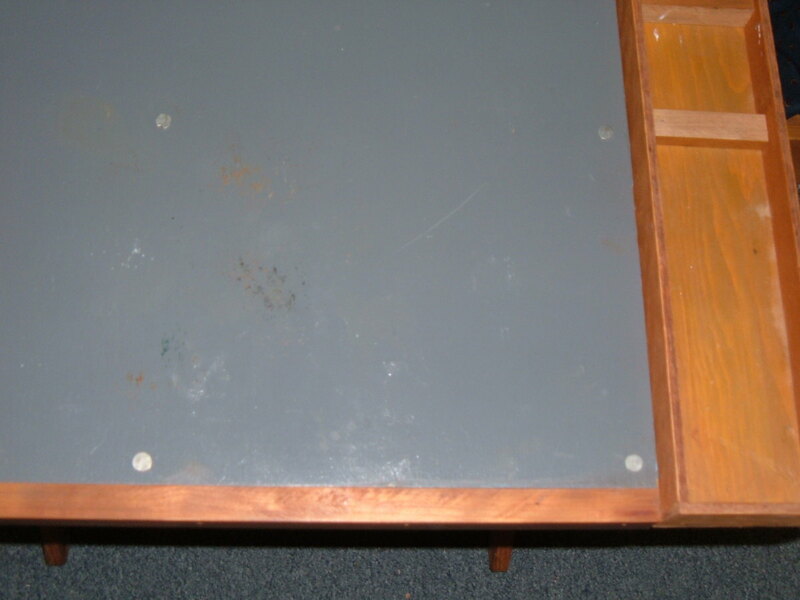 Attach several adhesive backed felt feet to protect the tabletop when the work surface is in use. Drive four short roofing nails with wide nail heads into the surface of the plywood as shown in the photos. 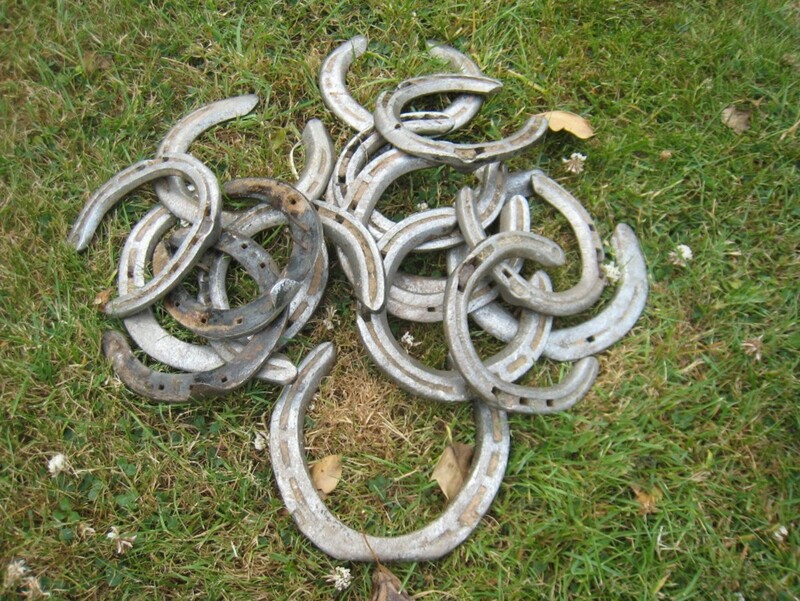 Be careful to use short nails that will not penetrate through the plywood, or cut longer nails to a suitable length. Together with four magnets, the nail heads make handy hold-downs for a piece of wax paper "palette" for mixing and using oil paints. Rather then cleaning a messy palette, simply throw away the wax paper! Do you have a dedicated work space for your Arts & Crafts? No. I use the kitchen table and I need a Portable Art Table! Painting with oils is relaxing and rewarding, but cleaning the oil paint from fragile and expensive artist brushes is messy and time consuming. Acrylic paints are water soluble and do not require solvents, but they still require careful cleaning to extend the life of the brush. Whether I'm painting with oils or acrylics, I tend to use a lot of different brushes. 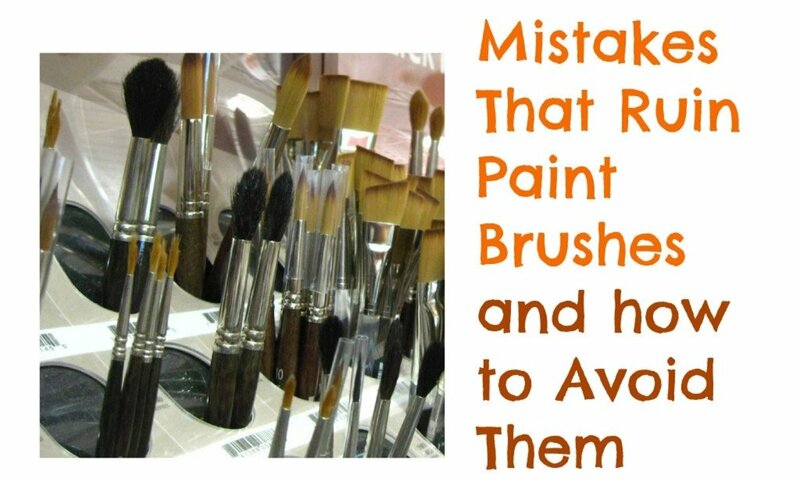 It is just easier to reach for another clean brush, rather than stop and clean off one that's already covered in another color of paint. Besides, I'll probably want to use more of that color before I'm done. When it's time to clean up, I often have a number of different brushes that require attention. Oil paints are harder to clean, but water-based paint brushes also need careful cleaning to extend the life of the brush. Here are a couple of tips to make the task a little easier. Newspaper is inexpensive, readily available and works well for removing excess paint from the brushes without bleeding through. Paper towels may be more absorbent, but the oil paint will quickly bleed through to your hands, creating another mess to clean. Newspaper is easy to rip or cut into sections approximately 6" square. I keep a supply of pre-cut newspaper squares in a plastic container as disposable rags for the cleaning process. Use the newspaper squares to wipe the excess paint from the bristles of the brush. With a newspaper square in the palm of your hand, lay the ferrule and bristles on to the paper, and then wrap the paper around the brush. While holding the paper firmly, slowly pull out the brush and the newspaper will collect most of the excess paint. Repeat with a fresh square until the brush comes out cleanly, and properly dispose of the used newspaper squares. Pour a small amount of paint thinner into a glass jar with a screw top lid. Use an odorless, artist grade thinner which is more refined than the common paint thinner from the hardware store. Swish the brush around in the paint thinner, removing more of the oil paint embedded in the bristles. Wipe the paint brush bristles with more newspaper squares to remove most of the paint thinner. The paint thinner can be used again and again; store the remaining thinner in the closed jar, and the oil sediment will settle to the bottom. 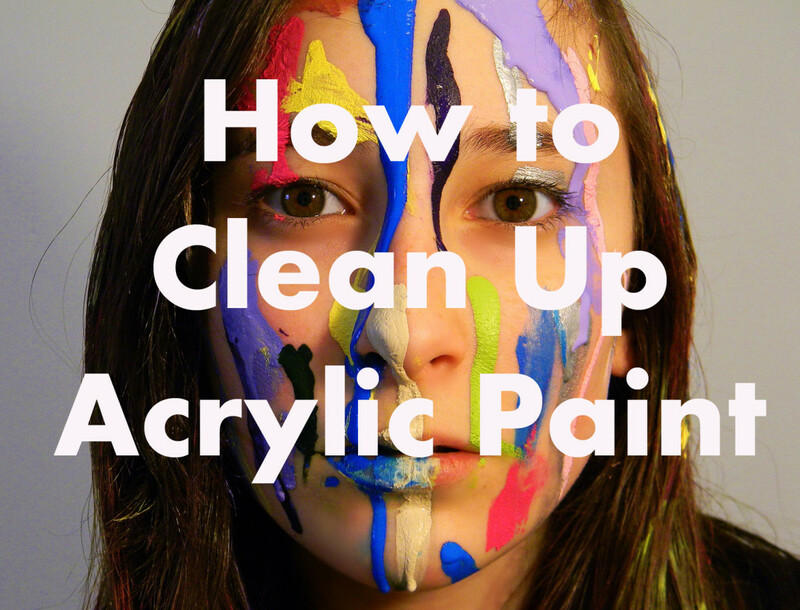 Do not use paint thinner on acrylic paints. 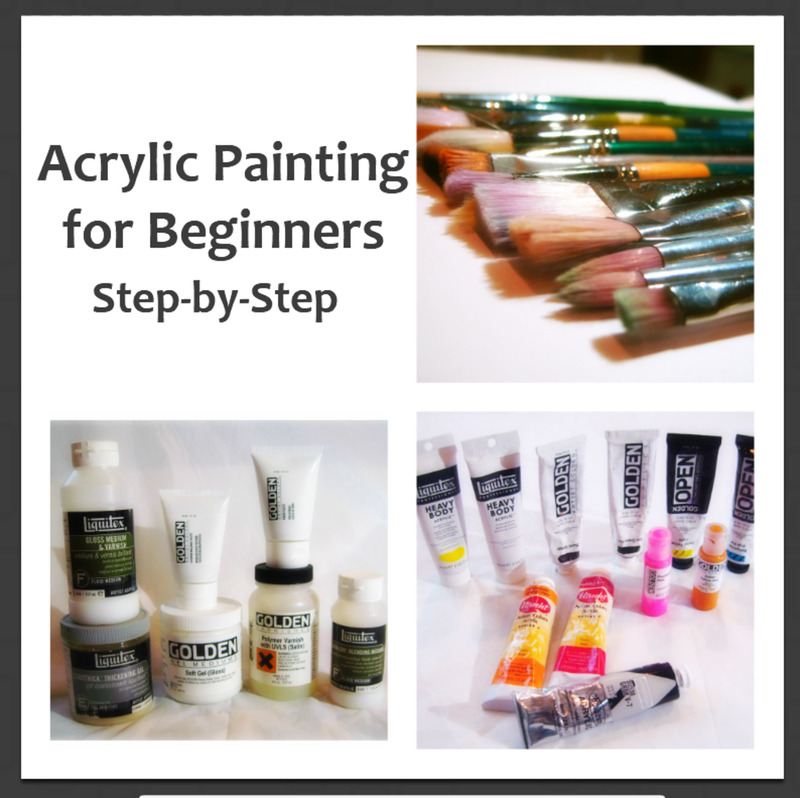 If using acrylic paints, skip this step. Rinse the brush bristles in the sink under warm running water. Let the running water pool into the cupped palm of your hand, and slowly turn the brush in the running water while gently pressing it into your hand to remove any remaining paint still trapped in the bristles. If needed, re-form the bristles back into their original shape. Stand the cleaned brushes upright on their handles to dry in an Artist Brush Holder. The Artist brushes are now ready for your next painting project! I really like the idea of the newspaper. I'm going to try that right away. Nice, informative lens. Now, this would be a nice project for the Christmas holidays! We'll make a brush holder for my mother, who is an artist.